Homer Bailey is the Reds’ big risk, despite not having a history of injuries (other than a bothersome groin). A number of things go into this ranking, including his age, increase in workload, and his mechanics. Bailey was recently named in Tom Verducci’s “10 for ’10: Young aces most at risk of Verducci Effect.” The 23-year old finished 40th in baseball in Pitcher Abuse Points with 27780 in only 20 major-league starts. Bailey’s innings jumped from 147 2/3 innings pitched in 2008 to 203 innings in 2009. He was one of the game’s top pitchers in his final nine starts of 2009, and the Reds leaned on him heavily during those starts. The La Grange, Texas native averaged 112 pitches per start during that time, furthering the thought that Baker likes to ride his top horses. If this doesn’t make your ulcer act up, you’re not a Reds fan. For the Reds to go anywhere in 2010, they will need a strong comeback from Jay Bruce. Bruce finished the season with a .223/.303/.470 line during his sophomore season, but a BABIP of .222 brought his numbers down severely. Bruce finished 2009 with a much better .266 EqA and a WARP1 of 1.8. The Reds will be looking for a number of things from Bruce in 2010. Bruce’s fractured wrist could very well be a fluke type of injury; after Bruce came back from the DL in September, fans got a glimpse of the Jay Bruce they had been hoping for. In 19 games after coming back, Bruce posted a .326/.426/.652 slash line. The Reds will be looking for more of the same in 2010. Red light – C Ramon Hernandez: Hernandez is an older catcher at 33 and his knees have become even older, as he spent significant time last year on the DL last year after knee surgery. Hernandez does, however, move into the low red because of his playing time split with backup Ryan Hannigan. Red light – 2B Brandon Phillips: Phillips has always been one who plays well through injury, but he seems to always pick up nagging chronic injuries. Last year, Phillips played through a slight fracture in his finger, and in 2008, Phillips’ season ended prematurely due to a fractured hand. Red light – 3B Scott Rolen: It doesn’t seem like it was that long ago when Rolen was one of the game’s best third basemen. He can still pick it with the rest of them, but chronic problems with back and shoulder injuries have put Rolen into the red. With no clear backup, this could a problem for Cincinnati when Rolen inevitably hits the trainer’s table. Red light – RF Jay Bruce: See the Comeback. Red light – SP Homer Bailey: See the Big Risk. 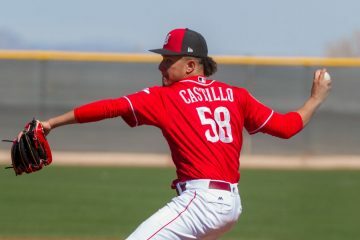 Red light – SP Johnny Cueto: Could this be a case of Volquez Part II or maybe Zambrano Part II? Cueto showed definite signs of wearing down toward the end of the season. It doesn’t help that Dusty is watching over him. 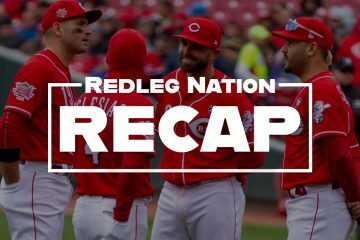 Yellow light – 1B Joey Votto: Votto’s inclusion with the yellow lights is completely based on the time he missed last year, which wasn’t a physical issue. He’s much less risky than this rating. Yellow light – LF Chris Dickerson: Dickerson is only yellow if he gets full playing time, and with the signing of Gomes, that isn’t likely. Yellow light – CF Drew Stubbs: Stubbs has had trouble staying healthy in the minors. The position adjustment also hurts him. Yellow light – SP Bronson Arroyo: Arroyo has pitched 200 or more innings the last five years, and the workload looks to be catching up with him. He’s an innings eater at best. Yellow light – SP Aaron Harang: Harang just hasn’t been the same since that fateful day in San Diego in 2008. Is this another case of Dusty striking again? Yellow light – SP Matt Maloney: Maloney is in the yellow only if he stays in the rotation, which is unlikely with Chapman and many others gunning for his job. Yellow light – CL Fransisco Cordero: Cordero is fine when healthy, but the team adjustment throws him a bit more than it should. Seems to be lots of items for discussion here. Drew Stubbs, position adjustment? Cueto, will taking the winter off help him in the 2nd half of the season? Votto, are his issues behind him? The concern trolling in this article is staggering. It hurts my brain to address each point, so I won’t. Suffice to say, every team in the bigs has a rap sheet exactly like this. @Sultan of Swaff: Yeah, nothing new here. Everyone has “concerns”, we can just hope that they are minimized throughout the season. Arroyo’s workload is “catching up with him?” Is there any concrete, or for that matter circumstantial evidence to dictate that? I mean, his most recent pitching performances only placed him in the TOP 2 in baseball…that must mean he’s a break down waiting to happen. This guy lost me with Stubbs’ “position change” and the “no clear backup” to Rolen. I’m pretty sure we’ve got at least 2 (Frazier, Francisco), if not 4 (Miles, Valaika) clear backups for him. P.S. Hi, my name’s Eternal Optimist. Nice to meet ya. I agree with the above comments. The red lite for Brandon Philipps doesn’t make sense at all. He’s durable and plays thru his nagging injuries. The yellow lite for Joey Votto is also stupid, unless there’s something I don’t know. His mental problem health problem was situational, it’s not chronic. A yellow lite for Arroyo ? I’ve been hearing that since he joined the Reds. I agree with the yellow lite for Cordero. He’s 35 and important peripherals declined last year. I think Cueto will have more stamina after a winter off. The yellow lite for Joey Votto is also stupid, unless thereÃ¢â‚¬â„¢s something I donÃ¢â‚¬â„¢t know. His mental problem health problem was situational, itÃ¢â‚¬â„¢s not chronic. I hope this is true about Joey, but the Enquirer ran a story awhile back in which (if memory serves) he said “it’s getting better”. I still have concerns. The red lite for Jay Bruce doesn’t make sense either. I’m not so sure that a Rolen ACL tear wouldn’t clear up the direction of this franchise more than anything else out there. We’d know EXACTLY who they thought was the best 3B prospect, and the rest of the positional issues would clear themselves up instantly. Not that I’m rooting for it, obviously, but forcing them to pick which one of the young bucks was going to be the 3B would answer a ton of questions. I will say that with panic disorder, you are never cured. Votto will have to cope with the same issues he dealt with last year. That said, he should be able to manage his issues better with proper clinical care. As for the pitchers, you can pretty well guaranty that one if not more starters will hit the DL. That’s just the way it goes and is a reason you can never have too many arms. If you can manage this level, then I think injuries won’t be a particularly huge concern. 1 – based on his reasoning, wouldn’t every pitcher in baseball be at least a yellow light? 2 – He flat out blames Baker for the Volquez injury and the late season breakdown of Cueto. I think winter ball and WBC was to blame, and I think that preventing Cueto from participating in winter ball this past offseason will be a big boost for him. 3 – He also says Baker is still using his pitchers like he did in Chicago, but it is obvious that the organization has pitch count limits, and none of his starters here have approached the 125-140 pitch count games of his Chicago starters. 4 – I think the concern about Bailey is overblown. 5 – How can Bruce be a red-light over a fluke injury like that? In his “down year”, he had a league average OPS (OPS+ = 100) with above average defense at the age of 22. 6 – I have no idea why he would say that “the workload looks to be catching up with” Arroyo. 7 – Harang was back to himself last year in the first 10 games until the 2 hour rain delay in Houston. 8 – I have no idea why Maloney is a yellow light. 9 – I have no idea what the Stubbs “position adjustment” is. Not to defend the article, really, but my understanding is that the red/yellow/green lights are very objective/based on a formula. You get a sense of that by the caveats the author uses to tamper down or ramp up expectations. Kind of like a car insurance company, even if your fender bender is an isolated incident (like Jay Bruce’s injury) it does tend to predict future injury. I think the positional adjustment was poorly phrased — upon further reading, i think there is an adjustment towards “more likely to have an injury” not because Stubbs has moved positions but because CF is more demanding/injury prone. Thus, Stubbs might Green if he were at a less demanding position, but he isn’t solely because it is expected he’ll play CF. Of all the abuse Dusty has dolled out, it is clear to me that he has been prevented from having a starter go more than 120 pitches or something, but he still abuses everyone. Harang’s two outings (SD and Houston) were awful, and we knew it at the time. Was Cueto/Volquez’s overuse WBC/Winter ball related? Maybe, but, God, didn’t/shouldn’t Dusty be aware of that, too? Bailey pitched in the minors — surely, Dusty knows this? Or does he think the only way to hurt an arm is high pitch counts in a single game, not IP in a season, etc.? Worse for me was Cordero. I remember a stretch last year nearing the end of the season where Dusty used him, like, 6 straight games. He was toast. We were there for game 6 and he was pumping in 84 mph fastballs which were getting killed. Cordero at his absolute best should not pitch 4 days in a row. That’s been his history. It was his 5th straight day of closing and he had nothing. Nor should he have. But Dusty should never have had him out there, to say the least. dave’s interpretation is correct, the author in fact says many of the things that people on this thread have said. like with votto, the system puts him at yellow because he missed time, but he acknowledges that the rating is probably wrong because of the reason he missed time. homer’s innings scare me, but i don’t fully buy into the dusty ruins pitchers thing. as far as i can tell the wbc and baseball in general do a pretty good job of that on their own. Actually, Cordero’s history is that he shouldn’t pitch 3 nites in a row. I remember the fiasco when he pitched 5 nites in a row – on the 5th nite, we couldn’t believe it (here on the blog) as Dusty brought him in again. We were nervous and then angry. I’ve occasionally defended the closer concept – arguing against closer by committee – but you’ve got to be reasonable about it. I like what the pennant winning 1961 Reds did – they had co-closers. One left handed (Bill Henry) and one right-handed (Jim Brosnan). They each had 16 saves for a total of 32, a lot for those days.